As infrastructure improvements continue in New Woodbridge, VDOT announced that it will be applying Slurry Seal in Dawsons Landing in Woodbridge, Virginia starting in March. 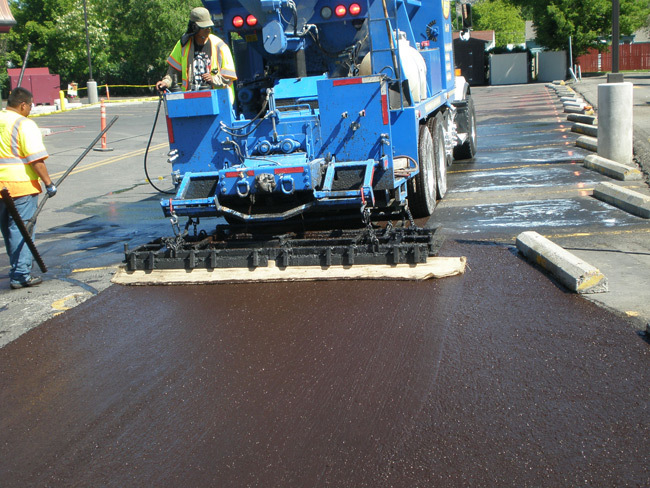 Slurry Seal is a mix of asphalt emulsion and aggregate that is spread over the entire road surface. Slurry seal maintenance dramatically extends pavement life. THE WORK INCLUDES Removing existing pavement markings, and installing temporary ones. • Patching of the pavement if necessary. • Sealing and filling cracks to keep water and other materials out, and to reinforce adjacent pavement. Limiting water from entering pavement layers helps to maintain pavement strength and prolong pavement life. • Spreading the slurry seal. It is applied by a truck with a squeegee or spreader box. The mix must cure for several hours before opening to traffic. This material covers the entire road, providing a uniform appearance and surface texture. A final sweeping, if needed, will remove any loose grit. • Permanent road markings will be replaced within 30 days of the new surface. WHAT TO EXPECT After slurry seal is applied, a small amount of stone may remain on the road. This is normal and should clear in four to eight weeks. Residents may experience a different road texture in the beginning, but the product will cure after several months and the difference will be less noticeable. WORK SCHEDULE Work across northern Virginia begins in March, and is expected to be complete by Nov. 1. Work is generally limited to off-peak hours. In residential areas, crews typically work weekdays from 8:30 a.m. to 4:30 p.m. Please note: there may be some time gaps between the above work stages. For a map and more information on all roads to be resurfaced in northern Virginia, visit virginiadot.org/novapaving. Roadway after cracks are sealed, but before slurry application. Finished product after slurry seal. Typical truck used in slurry seal operations. PLEASE KEEP IN MIND Temporary “No Parking” restrictions may be posted within the work zone. Crews will notify residents of the specific days by placing “No Parking” signs on the affected streets at least three business days before work begins. Traffic will be restricted to one lane during paving operations, which could result in minor delays. Access to homes will be available at all times, however, crews will restrict traffic from the freshly-applied material until it is fully cured, usually three to four hours. Please note that driving on material before it has cured can damage the road, soil your vehicle and track onto your driveway. FOR THE SAFETY OF OUR CREWS AND YOUR FAMILY Please remember to look both ways before exiting or entering your driveway, and to be aware that you may be entering a work zone. If you encounter crews or equipment in your area, please slow down and proceed with caution. We ask that you closely supervise children, even after work is complete for the day. Also, please follow the direction of flagmen and temporary signs and traffic control devices. We appreciate your patience and cooperation while we make these much needed improvements.